I don't write these posts with the intention to make people cry or feel all the feelings, but if that happens then I guess it happens. My intention of these posts is to showcase strong, inspirational women in my life who have pushed me to be the best version of myself, and I want people to know, especially those young impressionable girls, that the real role models, the real women you should look to for inspiration are not those girls on the covers of the magazines, but those girls and women who are living life with you, those girls who are in the trenches experience what you are going through. I'm not saying idolizing a celebrity is a horrible thing, some of them are really quite well rounded, but a lot of them well they have lived a very different life than you or I so how could they really know what's good and they are exposed to things that many of us never see. Spring is coming, I believe this, and I am waiting with bated breath. There are so many things that I love about spring, but one of the things I LOVE the most is that it means it's planting season! I am an amateur gardener and I am really a potato, swiss chard grower as those are the only two things that grow well for me in my garden. I need to get some sand in my garden, which seems like a weird statement, but my nice black dirt is so thick and gets so hard that I know I need something to help with this problem so that I can get more things to grow. Thankfully, I live in a province that has a huge agricultural heritage, and thankfully many people have come before me and have perfected the art of growing produce that I enjoy eating. So I don't have to become an expert yet, and I will continue to keep trying new plants but while I am doing my trail and error process I had best have a back up plan to enjoy my fresh produce. This is where the Jungle Farm comes in!! Four and a half years ago I left the teaching field, accidentally and on purpose. I know that sounds like a weird statement, but I left because I needed something that was more sustainable then subbing and would allow me to not have to carry two jobs, but would give me some flexibility in my time off. I was working a second job at Parkland CLASS at the time and a supervisor position opened up, since subbing was not going well, this felt like a good decisions so I went for it. I stopped subbing and took a Monday to Friday job in a group home. Now four and a half years later I have reentered the teaching field. I am not back in middle school, which is the area I left behind, I am now in a high school (my unlikely love as I was an elementary generalist). I am now working in a specialized classroom. I classroom I have had four and a half years of training to be qualified to work in not to mention the six years of classroom teaching I had done previously. It's Friday!!! So that means it's the Friday Five Link Up!! I am again joining up with You Signed Up For WHAT? !, Mar on the Run, & Eat Pray Run, DC, for their Friday Five Link Up!! This week the theme is food and drink. I try not to spend too much time watching television but there are a few shows that I just can't miss. I like to be entertained when I watch a show, but I also like a show to intrigue me, to get me to think. Sometimes it's those what if questions, sometimes it's the OMG what is going to happen, but regardless, I have three things to make a television show one that I watch! I'm a loyal viewer so as long a s a show can provide for my whimsical needs I will watch loyally. I like drama and intrigue. I like shows to keep me guessing, to get me thinking. I like strong characters, not strong actors, but strong characters, characters you could relate to, or want to emulate because they show admirable qualities. I like storylines to be more ensemble based then strictly on following one character. I also like my sitcoms to be funny, but to be funny because they could really happen. I really enjoy shows that mimic real life. Without going into a whole bunch of personal details about this friend of mine, I am going to tell you why ALL of you should have a Crush on this ferocious, but small woman!! One of my favourite Shakespeare plays is a Midsummer's Night Dream, in it Helena says of Hermia "...And though she be little, she is fierce" I love this quote, and it perfectly describes so many of my friends who may be considered short in stature, not me, I'm usually the friendly glamazon beside them. But this quote for me sums up so many of traits that I admire about Becky, that's her blog to learn more about her in her own words. Shop Local Tuesday: little studio, big heart!! When I was pregnant with Prince T, I was part of a dress club. Each month we would go do something different and hang out and visit. One month we went to Hot Pot Studio! It was so much fun!! I loved that while I was getting to be all creative I was hanging with some cool people and we were visiting and laughing. We didn't have to yell to be heard (and the back ground noise was minimal which was good because I had lost my hearing in my left ear). And we also got to see everyone else's creativity which was so cool! So after the first time I went back two more times! I want to go some more, but I've had to be smart with my finances so that will have to wait a couple more months. 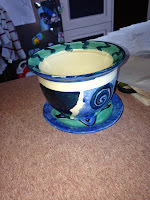 The first time I went I painted a little plant pot and plate. The second time I painted a popcorn bowl for Lil Man and the third time I painted a piggy bank for Prince T!! 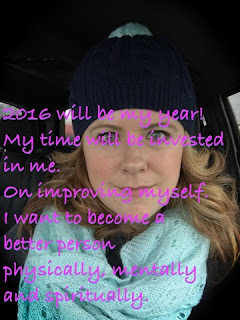 This year I am focusing on me! It seems like a selfish thing to say but I totally don't mean it in a selfish way, I just mean I am doing me. I work with a teacher and she says "you do you", and for some reason that really resonates with me. I have to do me! I've said this in past years but this year I am going to put it into action. I am again joining up with You Signed Up For WHAT? !, Mar on the Run, & Eat Pray Run, DC, for their Friday Five Link Up!! So this week it's a fitness theme!! None of these are written in the SMART format but they are summarized for you!! 1) This year will be my fittest and healthiest year to date. I am going to focus on my health and do things to improve my life and stop sabotaging myself. I am going to focus on my eating, eating whole foods and foods that are fresh and not processed or from fast food restaurants. It's going to mean I have to break habits, like eating donuts with my coffee or eating McDonalds when I am feeling rushed, which truly aren't habits I'll miss but I've got to get more organized. I write better when I have a theme to write about, which is why Monday is Update Monday, Tuesday is Shop Local Tuesday, Wednesday is Woman Crush Wednesday and Friday is Friday Five, but I have nothing for Thursday yet. And it's all good to have alliteration but it's not necessary, what I need is a theme, something to focus my writing for the month.....It makes things easier, and with everything going on in my life I like things to be easier. Ok for my first television review I will talk about my favourite guilty pleasure television show!!! For February I am going to showcase women who I think are just amazing and that need a little pat on the back for doing such a great job in life and they are inspiring to me. And as easy as it would be to say Oprah, Ellen, Reese Witherspoon or any other hollywood star I feel these women get enough accolades from the tabloids and other news venues that I'd like to focus on the real women in my life that inspire me daily. So today I am going to tell you about one of the most influential women in my life. It's an easy one, it's my mom! My mom is amazing! And I am going to share her story with you, at least from the time that I've known her. My mom is a divorcee and has been divorced from my father since I was three. She also has two other children my sister and my brother, and she has spent our life being a single mother to the three of us. I've worked in a few Home based businesses or Network Marketing Businesses. And there are some home based businesses out there that I love their products but I'm not going to become a consultant, or whatever it is they have for names of their distributers. But I thought today I would focus on the two Network Marketing companies that I am a part of and share with you all some of the perks of these companies. 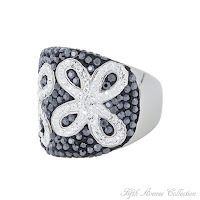 The first Network Marketing Company I started with was Fifth Avenue Collection Jewelry! And in my opinion they are the best jewelry company out there! They use natural gem stones and Swarovski Crystals. All their earrings are 14 karat gold posts or sterling silver hooks making them wearable for all people who struggle with earrings. We also use the Davinci clip for clip on earrings which are self adjustable and can be set for individual comfort. Working in a library will definitely increase your reading, if it's not then you aren't doing it right!!!! Seriously, I was working in a High School library for four months and I am pretty sure I read at least 30 books. I'm a reader as it is, but just being surrounded by those books every day made me want to read all the books, even those books that I would generally never touch. So here is a list of the books I read. This is a series by Kirsten Grier, it's a sci fi/ fantasy novel about a family who has time travelling genes and certain members are able to time travel and they have this big old mystery and a little love story as well! Great reads!! Both by a local author from the Rimby area, Kate Boorman. Great dystopian novels! !